When the Pilgrims gathered in 1621 to give thanks for the blessing of the past year, the seeds of Thanksgiving were planted, and in 1789, President George Washington declared it a National Holiday. We've celebrated this uniquely American holiday every November since. So much for history. What the day has come to mean for most of us is family gathering together over the traditional Thanksgiving dinner — turkey and all the trimmings. And that's the spirit you want to capture in your Thanksgiving photographs — the spirit of family and togetherness. This is a wonderful opportunity for great family pictures. After all, this may be your only chance all year to photograph the entire family together from the newest baby to great grandmother. But if you want to transform your so-so snapshots into memorable Thanksgiving photographs for the family album, here are a few simple guidelines to follow. The most important guideline is to know exactly what you want to be the subject of each picture. If it's Great Grandmother, when you look through the viewfinder make sure that she's the most important thing in the frame and try to eliminate anything that distracts from her. If the subject is the carved turkey, do the same for it. The second key element to capture in your Thanksgiving photograph is the spirit of the occasion, and we have already defined the spirit of Thanksgiving as family and togetherness. To capture that sense of family and togetherness, let's look in detail about how to set up two formal photographs — the "dining-room-table" shot and an outdoor family group portrait. First, let's look at a basic "dining-room-table" shot. A picture of the carved turkey, by itself or with all the trimmings, is pretty dull. But you can add life to the photograph if you think of the classic Norman Rockwell Thanksgiving painting of the family gathered around the table as Father is poised to carve the turkey. That's the spirit you want to capture in your Thanksgiving photograph. And here's how you do it. Position yourself and your camera at the far end of the table — directly opposite Dad (or Mom, or Uncle Bob, or whoever does the carving). Don't shoot from a seated level because the most important visible thing in your picture will be the clutter of dishes, silverware and napkins on the table and you don't want that. 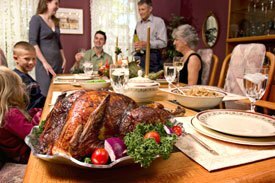 What you do want to feature in your Thanksgiving photo are the family members, the elegant setting, and the turkey. So stand up. If possible (and you are steady on your feet) stand on a step stool. From this higher vantage you can get all the family in your picture, along with the turkey and the person poised to carve. That makes the people and the overall table setting the important subjects, not the dirty dishes. Now don't make this a candid photo. Instead, direct everyone in what to do. Take one photo with them all holding up their glasses in a toast and looking toward the camera. Take another with everyone looking toward the about-to-be-carved turkey. Take one with them all talking to one another. 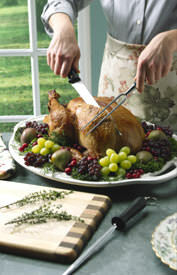 And in every Thanksgiving photo, the "carver" be it Dad or Mom — should be holding the knife at the ready. Hint: Avoid catching people in the act of eating. They usually look awful. Should you light this scene? If you camera has flash, use it. But the problem with built-in flash on many cameras is that it may be too weak to light up the far end of a long table. So, shoot some pictures without flash too, so that if the flash pictures are not well lit, the non-flash ones may be better. This way, you can take your choice. Another hint: For your non-flash shots, try to use a fast ISO, 400 or 800. If you can't get everyone on your end of table in your shot, don't worry, you'll include everyone in the next formal picture, the family group photo. Thanksgiving presents one other classic photo opportunity — a large group portrait. Since the extended family can amount to a small army that doesn't fit around one large table, get them all together for a special portrait. If additional friends and relatives will be dropping by for desert or an after-dinner cup of coffee, wait until they arrive as well. Consider gathering the entire group outside, perhaps on the front porch. The key to a successful shot — the key to any successful group shot - is the way you arrange the subjects. Don't line them up like soldiers at attention. Rather, aim for a casual up-and-down arrangement. If the porch has steps, have some people sit on the steps, sit some on chairs above, have some stand while others lean against the railing. Don't forget the family pets (if they don't keep wandering away). After you have everyone in place, check the scene in your viewfinder. Make sure you can see every face. If necessary, ask people to move closer together to close up any empty spaces. Remember, togetherness is the theme. Show this togetherness in your picture. Don't separate the family. Since it's likely to be getting late in the day by the time you get everyone assembled after dinner, we suggest you use flash for this photograph so that everyone will be visible in the photograph. Steady now. And we mean this. If you can use a tripod, do so. It's best for a large portrait. And, say something right before the shutter trips that will get them all smiling. "Say Cheese!" makes smiles look forced. Instead, we suggest having them say "Turkey." Try saying both words yourself. Feel the position of your lips and cheeks. "Cheese" leads to a smirk. "Turkey" (or as an alternative "honey" or "money") produces a smile. Another good reason to use a tripod is so you can leave the camera in a set position if you need to step into the group to make some last minute adjustments in the pose. That way, you can help Aunt Molly move a little to her left, straighten little Joey's hat, and get the dog back into the photo without losing the framing that you've already established. And don't forget yourself. If your camera has a self-timer and it's on a tripod, you can hurry into the picture before the shutter clicks. If not, ask someone outside the family to snap the picture after you set it up. Now the hard work is done. You've taken two great formal photographs that capture the spirit of Thanksgiving Day. Before you stop however, it's time to take some candids of the kids playing touch football, Uncle Max dozing on the sofa, and the "clean-up crew" at work in the kitchen. Here's a chance to concentrate on the individuals who make your family special and document the event. 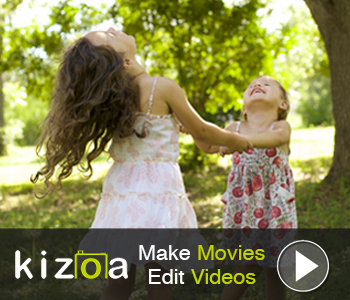 If you're feeling energetic, you could even shoot some family portraits. But your Thanksgiving pictures should not end on Thanksgiving Day and be forgotten. Since family and togetherness is the theme, follow through. When you get back the prints, select the best ones and make prints. You can arrange to send copies to everyone in them — and don't forget to also send them to those who were invited but couldn't make it. If a picture is really good, consider sending blow-ups — 5x7 or 8x10. There's no surer way to make yourself a hero in your family. 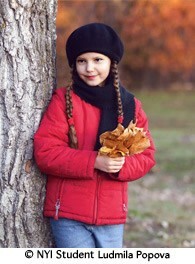 Your Thanksgiving photo session can solve another holiday problem. Thanksgiving photos, slipped into a nice frame, can also make great Christmas presents.